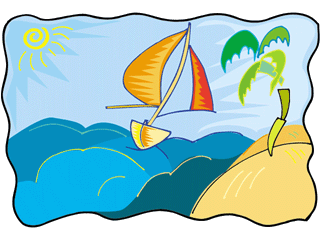 On this ESL at the beach conversations page there are example conversations and several exercises for you to do that will help you understand how to use the at the beach vocabulary when having a conversation. By looking at the examples and doing the tasks you will get better at using English. The first part of this page has two example ESL at the beach conversations for you to read and look at. They have also been made into short cartoons so you can watch the conversations take place. You can see how the words are used so that people can talk to each other. If you do not understand some of the words you can look at the ESL at the beach vocabulary page that has many useful words with their definitions. Situation: Patrick asks Lucy about her experience visiting Thai beaches. Patrick: Hi, Lucy! I heard you just got back from a trip to Thailand. How was it? Lucy: It was great! I went to several of Thailand’s most beautiful beaches. The white sand, the crystal clear water and the sunny weather were all fantastic! Patrick: Did you go to Patong Beach, the most popular beach in Thailand? Lucy: Yes, I did. I think the beach is very popular because it’s easy to go there. It does have a nice view but it’s very busy because there are a big number of water attractions. Patrick: Did you try the water sports? Lucy: I did! I tried parasailing and it was so thrilling! Patrick: Wow…! You’re really brave! Patrick: What about other beaches? Lucy: Well, the others are probably less popular, but in my opinion they are more amazing and above all, more relaxing. Patrick: Really? What are they? I should put them on my itinerary because I plan to go to Thailand this winter break. Lucy: Oh, do you? Um, my most favorite was Sunrise Beach. The scenery was just too much for the eyes and it was quieter there. The water was crystal clear. Patrick: What did you do there? Lucy: I went snorkeling and I could see all the corals under the water. Karon Beach in Phuket was also amazing. It was also quiet and peaceful there. Situation: Jane and Bob ask Tui to go with them to the beach. Jane: Do you want to go the beach this weekend? Tui: I’d love to! Which beach are we going to? Bob: Well, we haven’t decided yet. We’re still pondering some options. Jane: The nearest beach London has is Canvey Island Beach. It only takes an hour from London, but we go there often. Tui: And the other options? Jane: We can go to Kemp Town Beach in Brighton or Birling Gap Beach in East Sussex. Bob: Kemp Town is famous for its coastal walks, the Seven Sisters path along the south coast. Tui: What activities can we do there? Bob: We can surf, swim, and play kites. Jane: But the water is not so clean. I’d prefer to go to Birling Gap because the water quality is excellent. Besides, I want to try kayaking. I bet you haven’t tried kayaking. Tui: You’re right. I haven’t tried it. Jane: So you want to go to Birling Gap? Tui: How long does it take to get there? Jane: It’ll take us about two hours to go there by train. So? Tui: Is that okay, Bob? Bob: Actually, I don’t like travelling by train, but since I will be travelling with my friends it should be ok.
Now do the following three ESL at the beach conversation exercises. By doing them you will be able to use what you have learnt from looking at the above example conversations. When you do tasks or exercises you remember the information better as you have to use it. 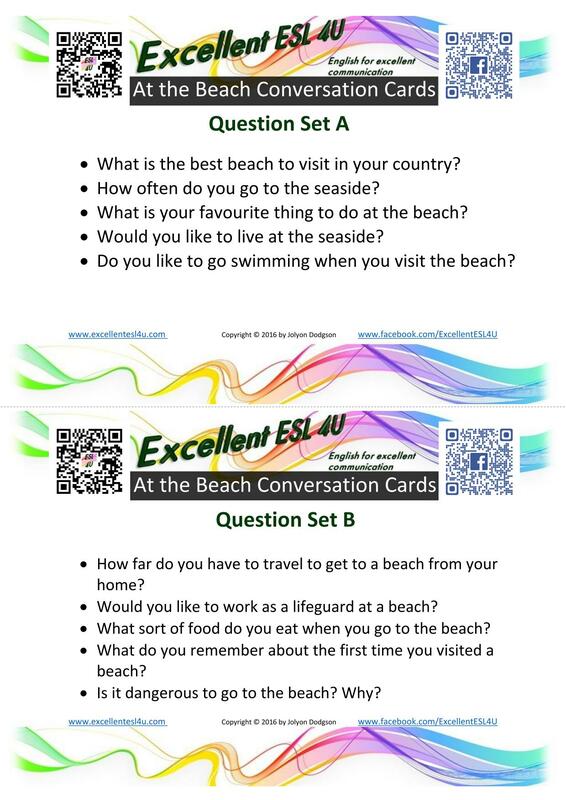 For the first ESL at the beach conversation task you need to look at the following conversation and decide which option (A-D) in each question is the best to fill the gaps. When you have finished you can use the get score button to see how many you got correct. Situation: Jane, Bob and Tui are on the way to Birling Gap Beach, East Sussex. They talk about beach activities. Tui: Are you going to tan your skin? Jane: Yes. I brought ____________________ with me. Tui: Are you too, Bob? Bob: No, I’d rather ___________________. Can you surf? Tui: Yes, I can, but I’m not good at it. I think I’ll just go canoeing and take some pictures while exploring the beach. Bob: Do you like ____________________? Birling Gap is a pebbly beach. Tui: That was part of my plan. I used to collect colorful stones and pebbles back in Thailand. Jane: Are you going to go rock pooling, too? Birling Gap has many ____________________. Tui: Rock pooling? What kind of activity is it? Jane: It’s a way to explore marine life in rock pools. You should look deep into pools, crevices and holes in the rock and even lift stones and seaweed to find some sea creatures that you often see on TV documentaries. You may find starfish, camouflaged fish, crabs, shrimps, …. Bob: Molluscs, barnacles, anemones, and lobster – if you’re lucky. Jane: But you should _____________________. You can find out the tide times on the local tide table. It’s usually available at shops near the beach. Tui: I see. Will you go rock pooling with me? Choose the best option (A-D) in the following five questions to fill in the blanks in the at the beach conversation given above. For the second ESL at the beach conversation activity you need to write a conversation. The conversation should be about going to the beach or what someone might do at the beach. You need to decide the people who will be involved in the conversation. You should use the conversations from above as examples. Include as much of the at the beach vocabulary as you can. Then when you have finished writing it you can find some friends and act out the conversation to get speaking practice. In the third at the beach conversation exercise you need to have a conversation with a friend. There are two sets of conversation topics. You should take one set and your friend has the other set. Then take it in turns to ask each other questions. When you answer try to say as much as possible and give long answers. When you have finished you can swap the conversation topic sets and start again. You can also download the questions as they have been made into some conversation cards. Just click the following picture. What is the best beach to visit in your country? How often do you go to the seaside? What is your favourite thing to do at the beach? Do you like to go swimming when you visit the beach? How far do you have to travel to get to a beach from your home? Would you like to work as a lifeguard at a beach? What sort of food do you eat when you go to the beach? What do you remember about the first time you visited a beach? Is it dangerous to go to the beach? Why?